Everyday when I leave for work in the morning, I blow him kisses while he lays in bed with daddy. Well, just before vacation, he started trying to blow kisses back. It was so cute. He practiced a lot on vacation and now he's an expert. The only thing is... he knows it's cute! So if we tell him "no," not only do we get a smile so big that it makes his eyes squint, but we also get kisses from Carter. It's really hard not to laugh and hug him when he does it, too. Oh the joys of parenting! 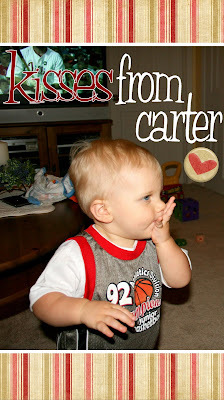 Carter is so darn adorable!